Gold was marginally lower in yesterday’s day session as we reached a low of 1195.10. In the overnight session gold has moved sideways to currently be trading at the 1199.50 level. On our “Intraday Chart” it looks like the rally from 1167.10 to 1220.70 is a five-wave impulsive sequence. The drop from 1220.70 to the current low of 1195.10 is still corrective looking, so we believe that all of wave .ii. likely ended at the 1167.10 low. We could therefore still see further weakness before all of this small corrective pattern ends and gold moves higher again, as we are still a bit short of our 50% retracement level for all of wave $ii$. We are working on the assumption that all of wave .ii. is complete at the 1167.10 low. Although we have now broken below the 1204.00 level, we will see where gold trades at the end of this week, and whether the 1204.00 level still holds on a weekly basis. 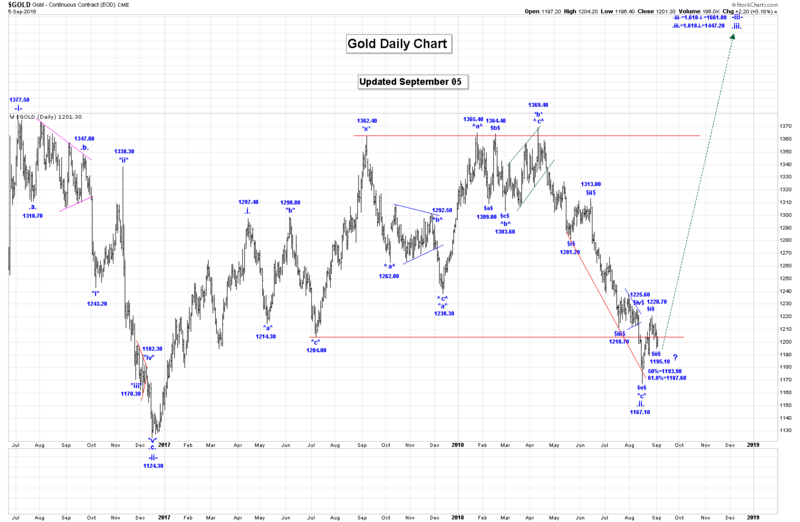 The jobs report is on Friday, and gold could easily close over $1204 based on that report. We do have higher projections and of course wave .ii. could subdivide into a five-wave impulsive sequence on its journey higher. Gold reached a high of 1220.70 last week, and we also closed above previous resistance at the 1204.00 level. It looks like gold has finally bottomed at the 1167.10 area, and based on that we are assuming now that all of wave .iii. ended at the low and we are now rallying in the initial stages of wave .iii. We are now waiting for confirmation that wave .ii. is complete at this low, and a break and close above the 1204.00 level was a very positive sign for this market. Many technical indicators are still near extremes in gold, which is suggesting that a reversal in trading direction is very close. 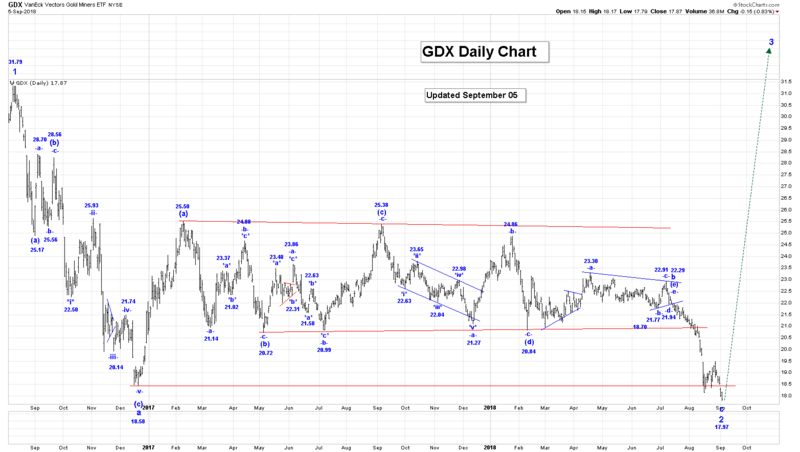 The GDX was lower in yesterday’s trading session and we reached a low of 17.97. We have broken below the support line around the 18.58 level, but we still believe that the end of wave 2 is very near. We will provide updated projections for the end of wave 3, when we are sure that all of wave 2 is complete. Kinross: Has now completed its minimum requirements for a completed wave (ii), at the 2.78 low. A huge wave (iii) rally is next. Barrick: We have completed the minimum requirements for a completed wave (ii) at the 9.72 low. We are now waiting for the start of huge rally in wave (iii). HUI: We have completed the minimum requirements for a completed wave (ii), at the 136.43 low. The next big event in this market should be a huge wave (iii) rally. 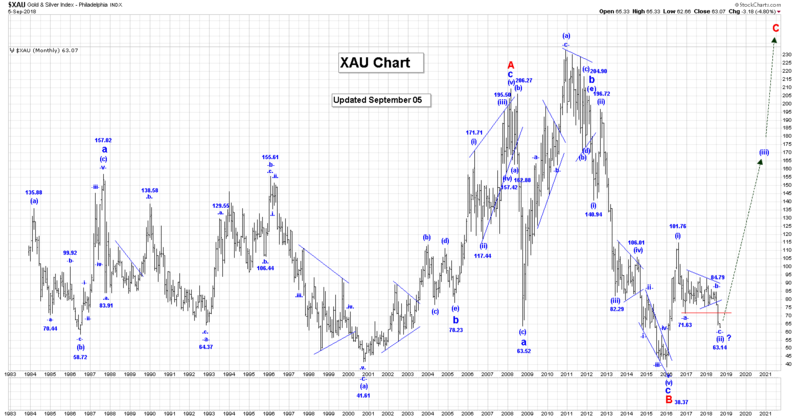 XAU: We have completed the minimum requirements for a completed wave 2 at the 63.14 low. The next big event in this market should be a huge wave 3 rally. 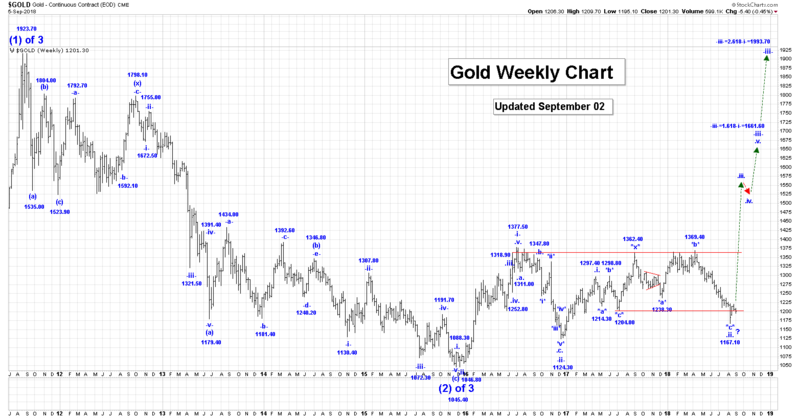 Trading Recommendation: We suggest buying all of the above gold stocks and indices, for a long-term hold. Free Offer For 321Gold Readers: Send me an email to admin@captainewave.com and I’ll send you our “Silver Market Action!” report. I highlight the key wave counts for silver and buy and sell tactics for my favourite silver stock! It goes out on Saturday, so the US jobs report action is included in the report.